There are few things in the world more luxurious than being pampered in paradise. 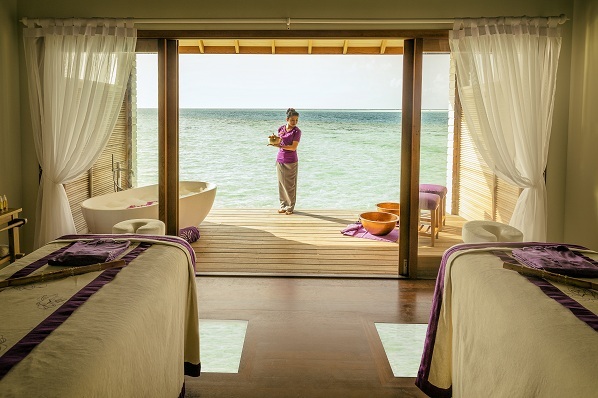 This December, the opening of the new Maldivian island, Hurawalhi, takes this one step further with its Duniye Spa. A perfect fusion of the natural and the decadent, the Duniye Spa exclusively uses chemical-free, organic, high-quality ingredients and locally-produced coconut oil whilst providing a service only capable of a luxury private island. ‘Duniye’, which means ‘universe’ represents the spa’s philosophy: a universal approach to wellness, with treatments inspired by ancient and modern cultures from around the globe. The spa villa sits over the ocean, offering a feeling of total immersion into serenity and nature. The spa is strongly influenced by the many healing traditions of Asia and Africa, complemented by The HealingEarth and PURE product lines which elevate the senses in both solo and couple treatments. HealingEarth is an African brand with each product lovingly created to harness the restorative powers of Africa’s rich natural resources. Developed by leading cosmetic scientists, all HealingEarth ingredients are carefully selected and meticulously researched, ensuring a pure product which connects users to the healing powers of Mother Earth. All HealingEarth products are free from synthetic fragrances, colourants, petro-chemicals, DEA, preservatives and parabens. For the ultimate in indulgence, the Maldivian Island Paradise Ritual is the one to try. This 120-minute treatment pampers from top to toe, leaving skin hydrated and hair nourished, thanks to the local 100 per cent virgin coconut oil. It begins with a freshly ground Coconut-Vanilla Body Polish which sloughs off dry skin, revealing healthy skin beneath. A coconut hair mask is then applied, whilst the skilful therapist provides an Indian head massage using rosemary-infused coconut oil. The oil is then left to penetrate the hair, deeply conditioning it in the process, while you lie back and enjoy either a Balinese or Muscle Ease massage with coconut oil.